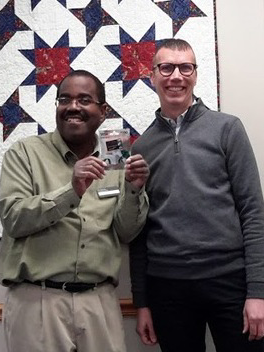 I’m pleased to give the Director’s Award for February to CADL Okemos Public Services Librarian, Eric Stanton. Eric is known for his kind personality and great demeanor. He’s led several successful book groups and film programs at CADL Okemos and has served on several library committees. He’s always willing to offer support where needed. Most recently after Anne Rau’s retirement, he’s become the resident expert on tax forms. So, if you need helping filing an extension on your taxes, contact Eric. Just kidding Eric!!! In all seriousness, thank you Eric for the work that you do. I’ve always enjoyed working with you and appreciate the work you do for CADL.